IT equipment and services are an investment in your business productivity. 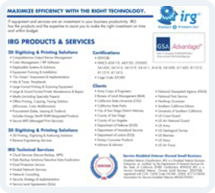 IRG has the expertise and product knowledge to assist you to make the right investment on time and within budget. With more than 30 years of accumulated experience in equipment procurement and installation, and with thousands of hours of hands-on maintenance and repair knowledge, IRG has unsurpassed expertise and experience. IRG is committed to the success and satisfaction of our customers. Our focus is on superior customer service and to share our vast knowledge base concerning large format products and services. We take pride in the quality of our work and in our ability to provide services in an efficient manner. Our goal is to provide our customers with a smooth and seamless ownership experience, starting from product purchase, through delivery and installation, and throughout the life-span of equipment, ensuring the highest degree of equipment productivity and performance. IRG is a total IT Solutions Provider to the Southern California region and beyond. We specialize in printing and imaging, scanning, and data storage solutions. Our award-winning service, along with equipment solutions, are industry recognized. we have developed reliable workflows and lifecycle solutions for our customers with wide-format printing, scanning, and data storage needs. Our customers rely on our professional, knowledgeable expertise to obtain the highest quality printing solutions. With the majority of our business developing from word of mouth, our reputation is unparalleled in the industry. We welcome you to contact IRG for a free lifecycle assessment today. IRG uses the consultative approach to new equipment purchases and implementation and can ensure that your printing and scanning workflows are set up to your satisfaction. We emphasize comprehensive, highly-specialized maintenance and repair service for your existing large format plotters, printers and scanners. We offer complete color workflow solutions. We specialize in large format plotters, printers, scanners, servers and storage -- equipment sales, onsite service & business continuity, and supplies.